HARARE, Zimbabwe — Zimbabwe's 94-year-old former president Robert Mugabe is no longer able to walk as his health declines, his successor said Saturday. "He can no longer walk but we will continue to take care of him," said Mnangagwa, who took over from his former mentor a year ago after Mugabe stepped down under military pressure. Mugabe was the world's oldest head of state before his dramatic exit following 37 years in power, a period in which he led the country from independence into repression and economic collapse. For years, Zimbabweans who saw their aging leader nod off during events speculated how long he would stay in office, while his wife vowed that he could rule from the grave. 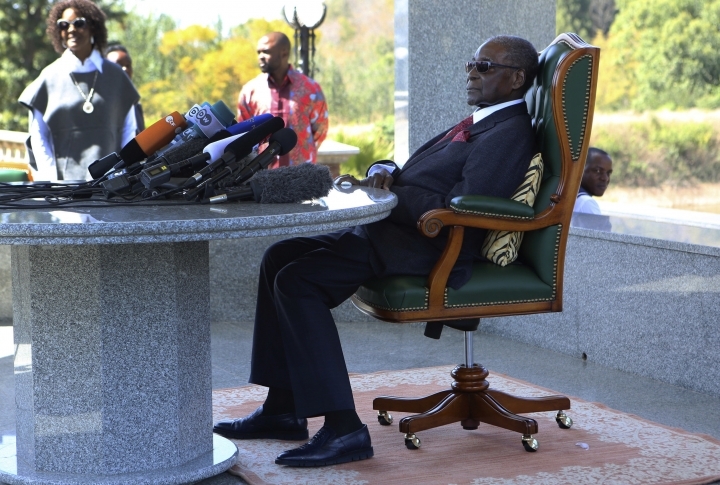 In a rare public appearance in July, Mugabe slumped behind a bank of microphones during a press conference and didn't leave his chair until reporters left. In his remarks on Saturday to supporters at a rally in Mugabe's home district, Mnangagwa said the former leader had planned to return to Zimbabwe on Oct. 15 but was not feeling well. Mnangagwa did not give further details about Mugabe's condition. The president and Mugabe, whose firing of Mnangagwa as his deputy led to his ouster, have made recent signs of reconciliation. Mugabe supported an opposition leader in Zimbabwe's historic election in July but in September said he accepted Mnangagwa's win. "All of us are now duty-bound to rally behind the government," he said.